Jerez de la Frontera, 1752: the city is captivated by the trial of a young man for a series of gruesome murders. Nobody is in any doubt as to the guilt of the accused, an orphan no-one much cares about. No-one, that is, except for the ‘poor man’s lawyer’, paid for by the council, the young Pedro Alemán y Camacho. An idealist weighed down by his weaknesses and limitations, Pedro has just amazed the people of Jerez with his closing arguments for two cases that seemed lost. Faced with the biggest challenge of his career, can he make sure that justice is done? 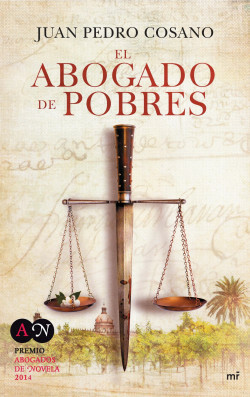 Premio Abogados de Novela 2014 winner. An exquisite setting, richly drawn characters, an increasingly intriguing and complex plot, an exciting historical context, a pacy rhythm that keeps up right to the end and a protagonist seeking redemption make for a complete work based on a little-known historical event: the looting of Spanish art by rich British collectors in the 18th Century.